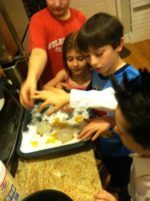 We made maple syrup last week!!! And you would be right – sort of. Traditionally, maple syrup season in New England is from late February to early April, but weather dictates when the sap starts to flow, not the calendar. Cold freezing nights and warm sunny weather during the day causes sap to mobilize and move from the roots into the branches to prepare the trees for budding. 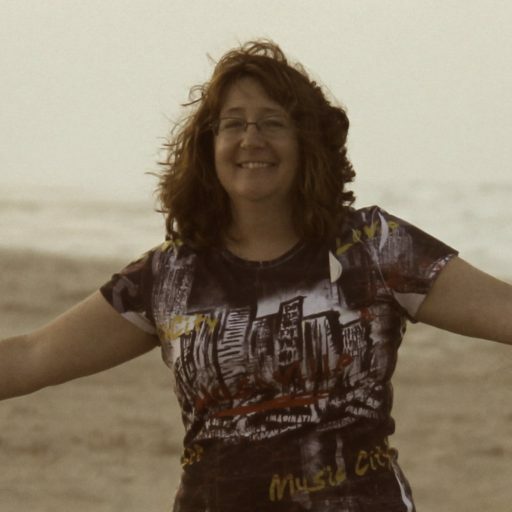 When we were in the process of buying our house, the prior owners gave us some maple syrup that they had made – and I have been itching to try it out myself ever since. We’ve been having an odd winter this year and had a week of what looked like perfect sap flowing weather. In my sap-collecting naiveté and my first-time-collector enthusiasm, I thought this week would be a great time to try it out! I must have had beginner’s luck, because it turned out delicious! I wasn’t going to leave everything up to luck and ignorance though. I had so many questions – would I ruin my ability to collect sap later on if I tapped the trees and it didn’t work? Would the tapped holes continue to allow sap to flow for the extended time? If we got another hard freeze, did I have to take the taps out and put new ones in? It turns out, it is not as complicated as I was making it. I did some reading and found articles that supported collecting sap as early as the month of January, if the weather was favorable. In fact, one study showed that collecting early when the weather was right could increase the yield. Taps could be left in and sap would flow when conditions were right, and would stop when they weren’t. The holes would close eventually, but probably not that much quicker than holes put in during the traditional time. (Growth of bacteria during extended temps above 50 degrees Fahrenheit is what closes the holes). We have four huge sugar maples on our property, but I was still a little unsure about going against tradition – so we decided to tap one. In the dead of the night (that’s when Spouse was home) we snuck up on our chosen victim, drilled three holes and tapped the spiles in. Sap started to flow immediately! And I admit to excitedly yelling – “quick attach the hose and jug!” Like it was going to be a tragedy if we missed one drop. 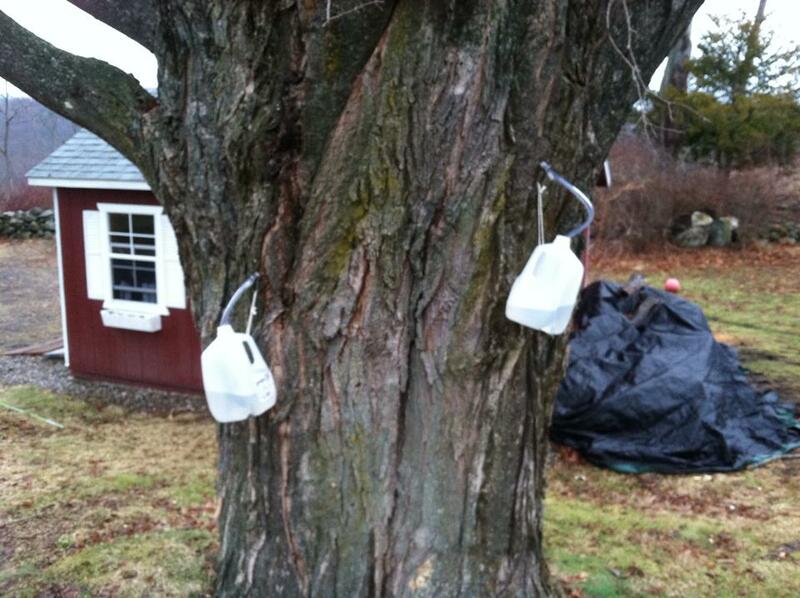 We attached hoses to the spiles and hung milk jugs (that I had washed with a 20% bleach solution) to collect the sap. The next morning all 3 jugs were almost halfway full. The kids were so excited when we went to check them before school, they were still talking sap when they got off the bus in the afternoon. By the next day we had collected about 2¾ gallons of sap and I decided it was time for a trial cook down. Did you know that sap is 98% water? 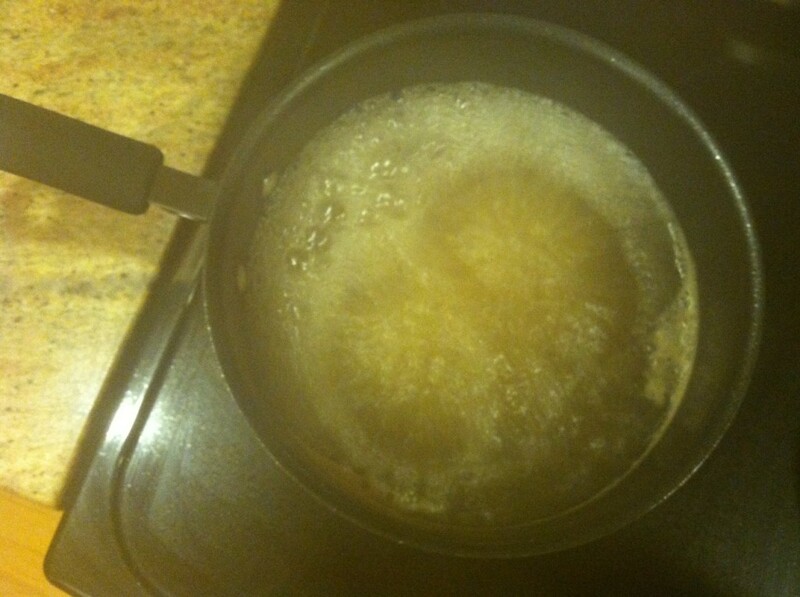 To make syrup, all you have to do is boil off the water. Sounds easy, right? It is, if you have patience, and a kitchen that can handle being turned into a steam room for a few hours. We boiled and boiled, moved to a smaller pan, boiled and boiled, moved to an even smaller pan and boiled again. Looks really interesting right? 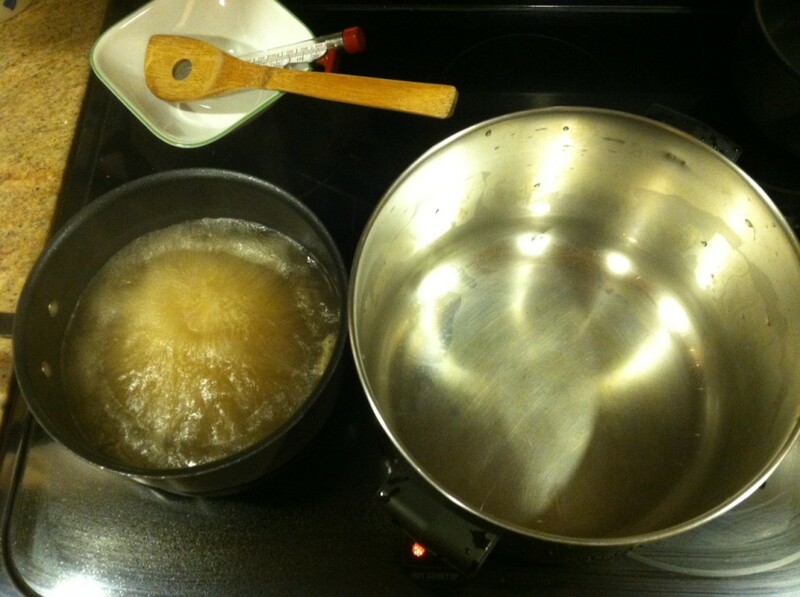 By the way, we debunked the age-old myth that a watched pot never boils. We watched them boil for hours. 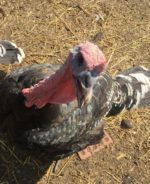 Next came the tricky part – how would we know when the syrup was done? If you cook the syrup for too long, sugar crystals will fall out of your syrup over time. If you undercook the syrup, you risk the growth of mold and bacteria with long-term storage. One not really recommended method is taste and consistency, but that isn’t scientific enough for me (although it didn’t stop me from tasting once in a while!). Plus, if all goes well I would like to give away some syrup as gifts in the future, and I don’t want to also pass along some fungus friends. Two scientific methods for determining whether you have successfully reached the syrup state are: boiling point and density. Syrup boils at about 7.2°F higher than water, which can easily be measured using a cooking thermometer. Syrup is also much denser than water. Density of syrup is measured using a special tool called a hydrometer. Essentially it looks like a thermometer with 2 red lines drawn on it. You place the tool tip side down into a cone of boiling syrup. When the hydrometer floats such that the red line furthest from the tip is just at the top of the syrup, it has the right density. We didn’t have a hydrometer lying around, Spouse couldn’t pull one out of his bag of tricks, and we weren’t going to have enough syrup to actually use the instrument, so we relied on boiling point. Being the scientists that we are, we did actually measure the boiling point of water with our thermometer. The boiling point can change with atmospheric pressure changes and we didn’t know if our thermometer was calibrated properly. 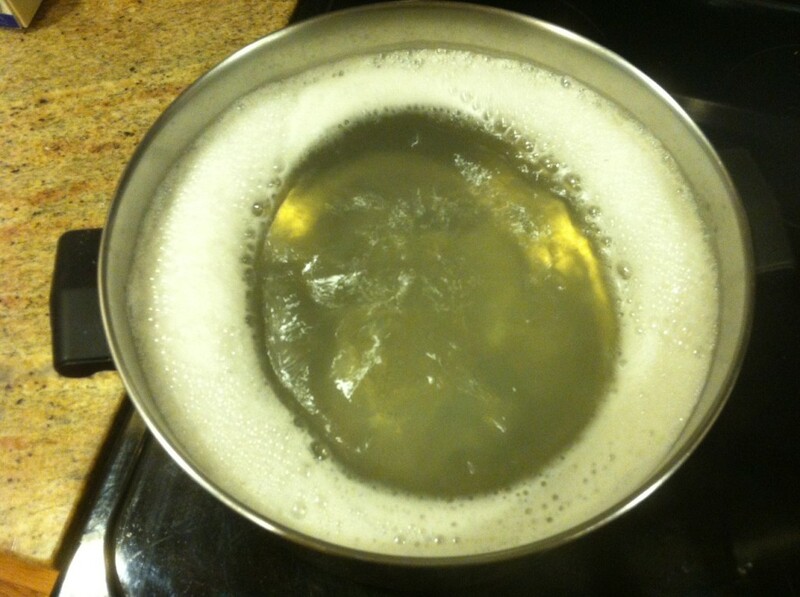 Rather than the advertised 212°F, our water was boiling at 207.5°, so we called it syrup at 215°. 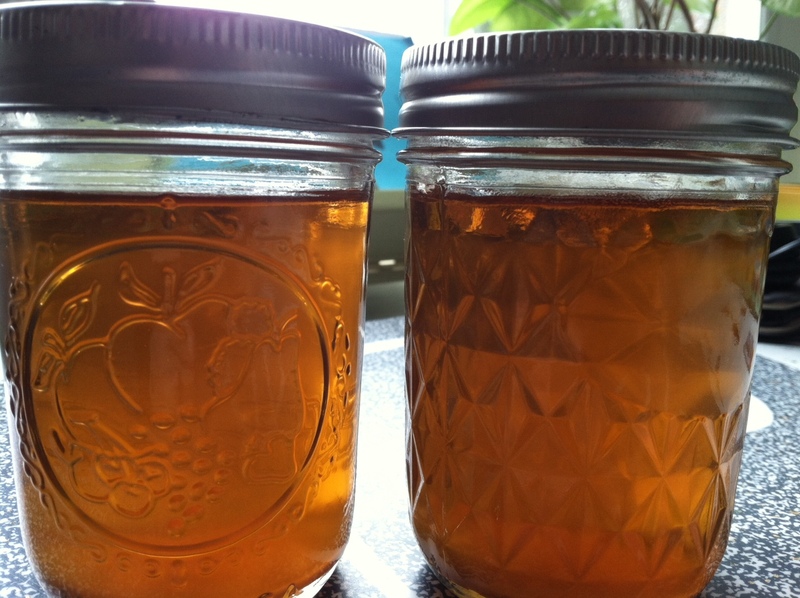 If you want pretty, clear, amber-colored syrup, then ordinarily you would filter your syrup to get rid of minerals in the sap. However, this is purely for aesthetic purposes and not filtering has no effect on the taste or storage properties. 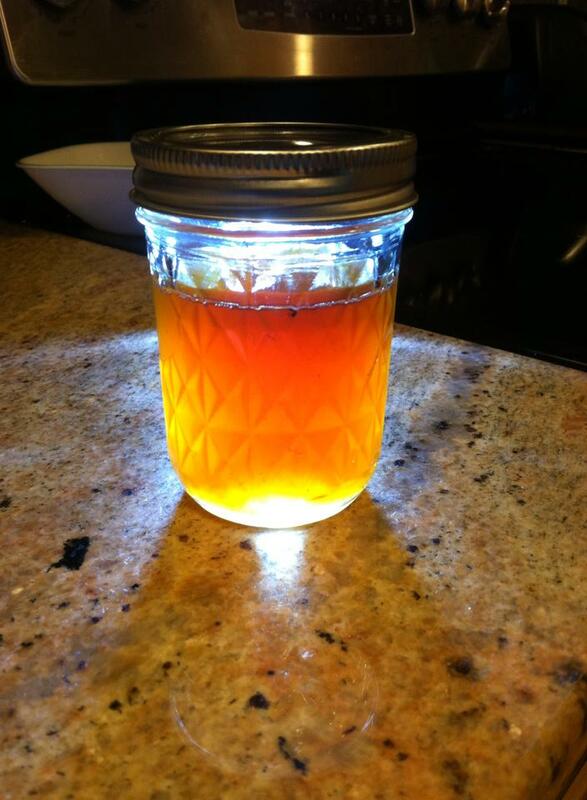 We chose not to filter and poured the syrup into a (single) sterilized mason jar. Yup, 2¾ gallons of sap made 6 ounces of syrup (minus some for tasting). And it only took 6 hours. (Now I know why real maple syrup is so expensive). I proudly noted that I was well within the standard of 3.2 ounces of syrup from 1 gallon of sap. Also, THIS IS THE BEST SYRUP I HAVE EVER TASTED! And don’t just take my word for it, the other syrup aficionados in our house agree. We were bummed for the next few days because the weather was rainy and cold and the sap wasn’t flowing. 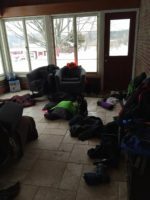 But then it warmed up again for a couple of days and we collected 4+ gallons more. We used this for another trial of syrup making and added 2 filtering steps: first through an orlon filter when pouring into our smallest boiling pot and second through a coffee filter just before it hit syrup temperature. It was definitely a lot clearer, but some particulates did still settle to the bottom over time. The weather is supposed to take a very cold turn tomorrow, so I think our sap collecting days are over for now, but I can’t wait for traditional sugaring time. I’ve had a taste and I want more!